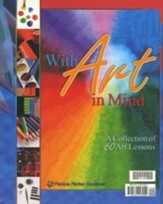 Accompany your Atelier Art Level 4-5 Program with this full-color print set. 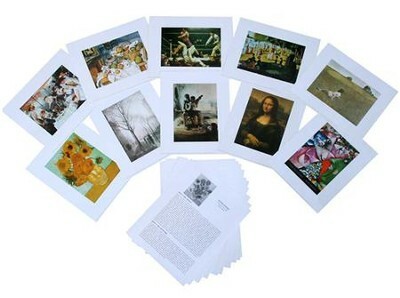 A fantastic, easy way to give students first hand encounters with high quality examples of art, students can use these to compare and contrast, find similarities among art forms, and see what is beautiful in the world around them. A set of Parent Print Guides are also included. 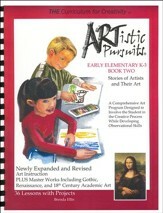 These cards give parents background information for art criticism, including how to describe, analyze, and interpret each art print. Individual guides for each print are also included, and provide detailed information about the artist and the artwork as well as scripted discussion questions (with answers) and activities/extensions. Print guide pages are loose-leaf and three-hole-punched, printed on cardstock. Prints are labeled; each print sheet measures 8" x 10" in total, with a 1.5" white border surrounding the center artwork, which measures approximately 5" x 7". Glossy paper. 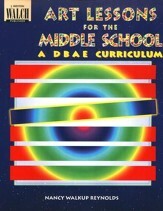 Level 6-8 is most appropriate for ages 7-13 / Grade 1-8. 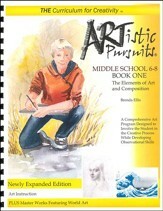 I'm the author/artist and I want to review Art Print Kit-M1 (enhancement for levels 4-5).